I had a surprise today. Mum stayed home! Last night she was putting the stuff that she uses to go play in traffic into the metal monster. So I expected her to get up early and be gone all day or even the whole weekend. But NO. She didn't get up early, she only left once to take something over to Grampie. Then she worked outside keeping the yard looking pretty. So what happened? Mum says that they called the event off as the tracked failed its safety inspection on Friday. One of her furiends called to let her know before she went to sleep on Friday. Don't remember that call, but it has been nice to have mum around today. All of the traffic playing stuff got taken back out of the car today. I think she liked it too, as she is getting things done at home that she wouldn't have done if she wasn't able to be home. So Yipeee for extra mum time today. Good landscaping is important. Overgrown lawns are bad feng shui. Eat all overgrown grass. Well I don't get to go outside to eat the grasses, so I just eat the stuff that mum grows for me. Mum keeps the outside grass under control with the grass eating monster, so I guess we will have good Fang Shui here. Plus yesterday it got all noisy and these little white rocks fell out of the sky. Mum says this is hail and she took a picture when she got home from working. I mentioned that mum went to an art fair this past Sunday. This is what she got! Mum says the sign is furry true, she always wonders what I am up to when she is not here. Heck, sometimes even when she is here! Then this cute little pin of a ginger cat. Sort of looks like me! Mum didn't buy this picture though. Or this suitcase with kittie pictures on it. About Grampie and the Harley. He just sat on it, he didn't actually ride it. He gave up driving a while back, so wouldn't even think about riding a bike. Mum says he is "Born to be Mild." Mum says this is a sedum plant, most likely Autumn Joy. Edsel posted on these and said the flowers looked like broccoli. Sort of, but mum says you wouldn't want to eat them. But the flowers start off as green then finally turn a pinkish red in the fall. Hey, we made it to the weekend again. Hope everyone has a good one! Mum saw this ad in the paper for apples. Ginger Gold Apples in fact. She thought they sounded interesting so she went to get some. They are small, but sweet and tasty. Mum likes them, but she likes ginger things, kitties and apples. She packed a few up for Grampie for his birthday today to take to him. I checked them out before she took them over. Plus when she got to Grampie's he had a surprise for her. They had brought in a bunch of Harley's for the day. So mum got a picture of Grampie on one of the bikes! Mum has hardly been home much to even turn on the puter for me. So I haven't been around much. She says that is the way it will be for most of this week. Sheesh, that is so just not fair. She needs to come home and be there for me. Not running around all over the place and hanging out with her furiends, eating out and stuff. The time with Grampie is OK, but otherwise, she needs to be home. 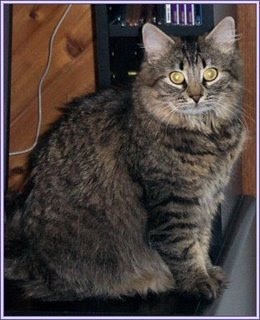 Oh and I was honored with a Kitty Limerick to day by Karen Jo. Thank you very much! Oh yeah, sunshine, bring it on. We have been having lots of nice sunny days lately, so lots of warmth and sun. Warm enough to have the windows open with lots of sun. I have a whole window full of sunshine to soak up. Mum has been very busy over the weekend. She didn't go to work on Friday but spent lots of time gone doing stuff. Saturday mum went over to Grampie's as her cousins from Illi-noisy were here to visit. Sunday, she and her furiend went to the local art fair. Mum took some pictures which I will post later. So I have been spending lots of my time napping in the sun this weekend. Not getting much time to visit my buddies on line. Happy Purrthday to Uncle Flip and Aunty Pam today. Mum says Flip's birthday has a zero on the end. Plus Grampie's purrthday is tomorrow. Loud noises are disruptive to feng shui. Avoid vacuum cleaners inside the home, and lawnmowers outside the home. Amen to no loud noises, but mum does use the sucking monster all the time here to keep things clean. The other monsters are not allowed in the house, like the snow and grass eating monsters. This is me, telling mum to keep the noise down! My shelter is going to really expand to help out lots more kitties. They got a big donation of green papers last month some of which will be used to expand the shelter. Specially making more room for kitties as they now have more kitties than woofies. It is a nice shelter now, this will make it even better. The story talks about how crazy the main lobby is and it is true I remember the day mum picked me up. Lots of people as they were doing a fund raiser walk that day, lots of woofies around. I was happy to leave, not just to come to my furever home, but get away from the noise. These are Black Eyed Susans. This picture was taken about sunset so the bright yellow makes the flowers stand out.The birdies like to eat the seeds of this plant. So we see all sorts of birdies flying around these flowers. It is the weekend gang, enjoy! Hi Matey's! Pirate Dread Vane here. The Meowers from Missori have declared it 'Meow Like a Pirate Day'. So I am! 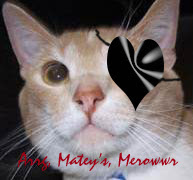 I have put on my pirate eye patch and done my nice deep meowrrrr. So you better join in, or we will have you walking the plank from the Good Ship Sassycat! Now it is time to hoist a few brews and toast the pirate brigade. Arrrgh, Mateys's. Yep, that is me, I am happy. Aren't we all happy with our homes? We are well cared for by our beans. So we sleep. I think I was trying to protect my eyes from the flashy box thing. Hoping that the flash wouldn't wake me up. It got furry cold here over the weekend. Mum and I had to snuggle to stay warm. All of the windows were closed on Saturday. It didn't get cold enough to kill the flowers, not just yet. But it is supposed to be warm enough in a few days to have the windows open again. There are power places outside of your home. Trees are good for their wood energy, unless you climb too high and are unable to get down. If that is the case, annouce your predicament, and help will arrive shortly. Since I don't get to go outside, the highest place I can get is the top of the big cold box. Thankfully I can get both up and down without a problem. But when I am up there, I am tall than mum. Sometimes I try to get at the top of her head and put the bitey on it. Well, not exactly a flower, but the crabby apples on our crabby apple tree. Mum says they never get very big, and we leave them on the tree for the birdies. But mum says for the first time, we have so many little apples the tree branches are sagging. So a bumper crop for the birdies to eat. Plus a thank you to Miles and Sammy Meezer. The gave me a "Nice Matters Award". I am not sure who started this, but it is to recognize kitties who do nice things for others or a special concern for our beans and other kitties. I am very humbled to get this. I don't think I am doing much special, just being myself. 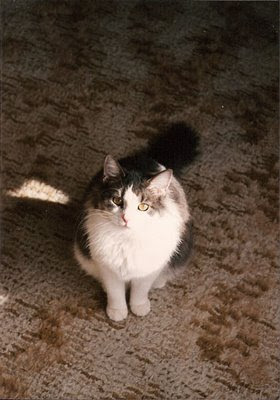 Mum has raised me to be a good kittie and not just always think about myself. And as far as I am concerned everycat in the blogosphere deserves this. But my special nomination will be The Crew! Hope everycat has a wonderful weekend. It rained some the other day and when mum got home she put out her brolly to dry. I thought I would check it out. But later I wanted to check it out from on top, so I jumped on it from the top of the TV (which is behind it). I broke it! The handle bent over really bad and mum can't get the thing closed. Sorry mum. She does have a spare brolly to use. Plus the new puter has arrived, actually on last Saturday. Mum has been busy getting it all set up for the past few days. At first it seemed slower than the old one, but now it feels faster. The boxes are nice too. So mum's lap has been full of laptop. Feeding the puter, shiny disks, clicking and pointing. We finally have our cat buds links all set up. The comics are back, news, weather and other goodies. The purity of a person's heart can be quickly measured by how they regard cats. - Anonymous Well that means our beans all must have pure hearts. They treat us really nice. We are fed and loved. They do stuff that is good for us, even when we don't like it, like taking us to the VET. We show our love in return. We purr and meow at them, rub them and sleep with them. Sounds like a good arrangement to me. Mum saw three vishus deers early Friday morning on the way to work. Actually not far from where we live. It was a mom deer with her not so little babies. They were really near the road eating apples that had fallen from the tree. Mum was happy that they were busy eating and did not run in front of her metal monster. Mum was not around most of Sunday. She went to spend the day with Grampie and normally they both come here in the afternoon. But since Grampie's birthday is coming soon, mum took him to see a furry special show and then dinner. The show was of horsies, horsies that dance. The Lipizzaner Stallions. They had front row seats! Here they were parading the flag around on horseback. They had everyone rise and even sing the National Anthem. Mum thought that was nice. The horse was very calm even with all of the singing. Here are all 8 of the riders on their horses at one time doing a big circle and keeping in time very well. This horse is getting all excited, it is shaking its tail doing a good job showing his fancy footwork. Mum said 6 of the 8 riders were women. This guy was recognized towards the end of the show as he help rescue the Lipizzaner's at the end of World War II. He got a standing ovation from the crowd and rightly so. So they had a really nice day together. Mum said Grampie appreciated seeing the horsies as he grew up on a farm and worked with horsies when he was young. They had horse drawn farm equipment before they had motorized tractors and such. Be aware that prey consumed indoors will affect your relations in the home. Prey consumed outdoors connects you to the external world. Never eat in an open doorway, however, as this represents confusion and can get you stepped on. I had hoped to do this last week in honor of her Gotcha Day, but couldn't. So my flower of the week is Precious Flower. Hasn't she grown up to be such a lovely young lady! Furry warm here again and mum says the nasty squitos are eating her when she goes outside. They are so bad she doesn't even want to go out to fill the birdie feeders, but she must as they are all about empty! I need my entertainment you know. I finally made it through all of my linkies and caught up with everyone. Even left a few comments. If I missed out on any meme's I apologize, I will just pick up with what new stuff comes up. The latest news is that Ayla has gone to The Bridge. Rest well and have fun. You are free from pain, healthy and energetic. Play well. We will meet again. Mum has finally been able to get the old puter back. She is trying to get the basics on it and we will use it for a backup. So I will be around and beginning to check on things. But at least we are slowly getting back to things. Mum won't have to worry that she will get yelled at by work for me using her work puter. So I need to get back to snoopervising her to get this stuff updated. Remembering all of our friends who passed to The Bridge. Ana, Brendan, Oscar and U-bee.